90% of Africa’s cultural heritage currently lies outside the continent, including the Benin Bronzes in the British Museum. This is one particularly vivid illustration of how central forgiveness is to many African cultures - something that could not be said of most European ones. This difference across the continents could help explain some recent puzzling comments made in France regarding Africa's looted heritage. 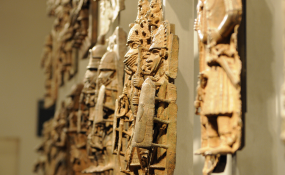 Entitled "The Restitution of African Cultural Heritage", the report presents the seizure of African artefacts as a crime against peoples, drawing notably on examples from Europe itself. In its opening paragraph, it notes that 2,000 years ago Greek historian Polybius bemoaned the double penalty that Roman plundering of Greek heritage inflicted. Not only were Greeks deprived of their heritage, they were also subjected to the humiliation of seeing their objects displayed as spoils of war in Roman cities. The report also cites a 19th century German philosopher who framed the message of cultural heritage raiders as being: "In the future may it be harder for you to learn and cultivate yourself." Sarr and Savoy move on to show the extent to which the looting of African art was central to the colonial enterprise. It describes how in 1897, for example, a Berlin museum director rejoiced on learning one of his students was to participate in a punitive military expedition in Cameroon. "We can expect great things," he is quoted as saying. "[My student] is well-informed on what we are in need of and will attempt to take great care in finding something for us." The inherent injustice and extent of these practices - an estimated 95% of sub-Saharan Africa's cultural heritage is outside the continent - lead the authors to reject compromise solutions. Instead of loans or touring exhibitions, they recommend the permanent return of illegitimately acquired objects when requested by an African country. The answer is that in the West, the act of pardon is mostly the reserve of God, priests and occasionally presidents. Their systems of justice are based on retribution: blame is assigned and a sentence handed down. In this win-or-lose system, distance is created between the wrongdoer and the wronged. The offender is not expected to ask for forgiveness. In fact, they are expected to defend themselves and present mitigating circumstances, even as that deepens the victim's pain. On the question of the restitution of African heritage, the continent is still crucially waiting for its mam sugri. We are still waiting for an expression of contrition that would put a salve on our wounds. We are still waiting for an acknowledgement of our pain that would allow us to forgive, as we have been taught from childhood. An apology in of itself would not be sufficient, but it is the necessary first step for us to start considering solutions that might go beyond the Western win-lose schema. Some of these ideas may well resemble those favoured by France's Culture Minister, but they could at least be embarked on without the bitterness elicited by the current absence of an apology. This is a start, but much more is needed. And in the case of Africa's looted culture, mam sugri is a prerequisite before we can think about the Sarr-Savoy report's sub-title of working "Toward a New Relational Ethics". So, European countries, stop being afraid. Don't get defensive. Ask for forgiveness. You will be forgiven. There will still be a long way to go, but the dialogue on the return of African heritage - whatever form it takes - will be all the smoother.